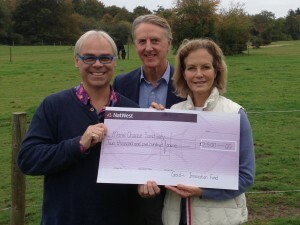 Mane Chance Sanctuary, founded by actress Jenny Seagrove, is the first recipient of funding from The Gold-i Innovation Fund. A cheque for £2,500 was presented by Tom Higgins, CEO of Gold-i on 23 October 2015 to help fund bursaries for the pioneering Chance 4 Trust (C4T) Programme which benefits young people in Surrey aged 8 to 18 years who have social or emotional behavioural difficulties and are often excluded from mainstream education. The C4T programme includes one to one therapy with a specially trained C4T practitioner and involves the young person interacting closely with the horses at the Mane Chance Sanctuary in Compton. A pilot study earlier this year with children who had experienced high anxiety levels in some school situations resulted in very clear benefits, ranging from reduced levels of conflict to increased emotional resilience. It also had a positive impact on the horses who are in recovery at the sanctuary after being neglected, mistreated or abandoned. We are hugely grateful to receive the funding from the Gold-i Innovation Fund. The C4T programme is truly groundbreaking – it helps to heal our horses at the same time as helping young people in our community with particular challenges in their lives. I am so pleased that we now have the opportunity to roll the programme out to support young people who would otherwise not be able to access this remarkable form of therapy. The Fund was established to help charities and local organisations in Surrey to push boundaries and do something innovative or remarkable. The C4T programme is hugely inspiring and I am very proud that we are able to support them with our first donation. Mane Chance Sanctuary is a local charity which rescues neglected, mistreated and abandoned horses and seeks to bring them back to full health, both physically and emotionally. The sanctuary is located on a 47-acre site in Compton and aims to integrate the animals with the local community.